I’d seen the pictures that week of family and friends celebrating his 94th birthday at the Chick-fil-A in our tiny town. So, of course I wanted to join my “happy birthday” with theirs. He accepted my birthday wishes with a friendly grin and then opened up his wallet to show me a treasure, not cash or check or credit card, of course. No, he had packed his wallet full of small Gospel cards that he’d designed and had printed up himself–200 of them. He fingers the Bible verses as he tells me all about them, about how they tell of Jesus loving us, dying for us, forgiving us….and how we can spend eternity with Him if we accept Him as our Savior. Then he touches his hand to the cross he wears, two nails formed together, and he tells me how he’s given away oh 14 dozen or so because Jesus took the nails for him and me and for all of us. I gave him a birthday greeting. He gave me the Gospel. I received the greater gift. He knows who I am, knows I’m a Christian, worships with me every week at our church. Still he shares. I smile as he talks, smile at his enthusiasm and his boldness, and smile to think that Jesus must be his very favorite thing to talk about. How many hundreds of times has he shared this very same message with others? That’s what I wonder…that’s why I marvel. And that’s why, later that night, I still ponder a 94-year-old man who used his birthday to share the Gospel with a church-girl like me. I feel the Holy Spirit nudge, the conviction deep. He, after all, overflows with the gospel. He tells me about Jesus not because I need to know or because I look like a lost soul, but because talking about Jesus is what He does everywhere, to everybody, without fear or shame or concern for public opinion. There’s no keeping it hidden, no compartmentalizing his conversation into Jesus-talk for church folks but small talk about the weather for anyone else. 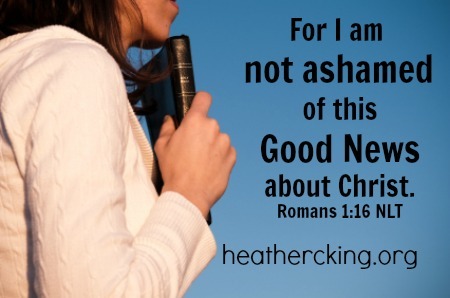 For I am not ashamed of this Good News about Christ. It is the power of God at work, saving everyone who believes–the Jew first and also the Gentile (Romans 1:16 NLT). Could I say this about myself? It’s easy, of course, for God, Jesus, the Bible, grace, sin and forgiveness to be my sometimes conversation in safe places with safe people at safe times. But I’m a people-pleaser, anxious not to offend, worried about the awkwardness of a difficult conversation, the tension of loving confrontation with the truth, or what might happen if someone doesn’t like the salvation message on my Christmas card. Faced with this man, though, who is clearly not ashamed of the Gospel of Jesus Christ, I long for unashamed boldness and passion. ….I believe one of the main reasons people don’t share their faith in Christ is that they don’t really believe in hell. Many of us are out of touch with the genuine urgency. He hits the truth and I wince with this pain: I don’t feel the urgency to share the news of Christ. I believe the Scripture and that our choice here isn’t heaven or nothingness….heaven or a lesser heaven…..heaven or a mildly uncomfortable but ultimately more fun destination. It’s heaven or hell. Either/or. Black or white. Here or there. No in between or sugar-coating or gray. Yet, I’m sometimes more worried about the here-and-now consequences of a difficult conversation than I’m concerned about the ever-after results of others not knowing Jesus. Street preaching or door-to-door Gospel-selling isn’t the mandate here. Being articulate, clear, simple, passionate. That’s the example he sets for me, a 94-year-old man with a wallet full of Gospel cards and a pocket heavy with nail crosses. That really made me take a long look inward! Talking with him that night really impacted me! !